I’m not doing NaNo this year, but I’m following the progress of several people I know, and I’m very excited! First, I’m excited because they’re all working on projects I know about and am happy to see moving forward. More important, I’m excited because of their attitudes. I’m behind on word count. …and so on. But, this year, that’s all accompanied by self-care, self-compassion, and self-encouragement. They’re giving themselves permission to use NaNo as I believe it was intended: As a thrill ride, a group adventure for solitaries, an incentive to take a plunge, a kick in the pants for sluggish creative impulses, and a nyuk-nyuk-nyuk in the face of brutal inner editors. Sure, set yourself a word goal, and push yourself to meet it, but shrug it off if you don’t. The word count and, indeed, the whole challenge is there for you, not you for it. Sure, strive to “win” NaNo, but understand that, if your creative juices are flowing and you’re working on something, you’ve already won. Sure, this is a month to give priority to writing (when I do NaNo, everybody understands that I’m a different animal in November). But, if you need to set your writing aside in order to be a decent human being or in order to take care of yourself, anybody who calls you a slacker is going to have to go through me first. So hooray for NaNo! Hooray for my friends, who are being happy and healthy about the challenge! If you’re doing NaNo, hooray for you! If you’re not doing NaNo, join me in lifting a glass in the NaNoWriMoids’ honor! I’m proud of you, and you’re only one week in. A WRITING PROMPT FOR YOU: What is your main character proud of having participated in? This entry was posted in Writing. Tagged pep talk, the writing life, the writing process. Great pep talk!! 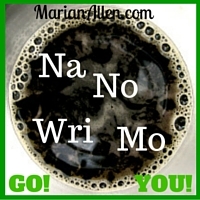 Go ye forth and NANO! Or as Mork would say…. WHAT? He would say it; you know he would. Thank you for the pep talk! 🙂 I gave myself the day off yesterday, but sometimes that’s the most productive thing to do! Right you are! I’m so glad to see so many of my writerly acquaintances enjoying NaNo this year! NaNoers are all heroes, and I love ’em! Also: beer.